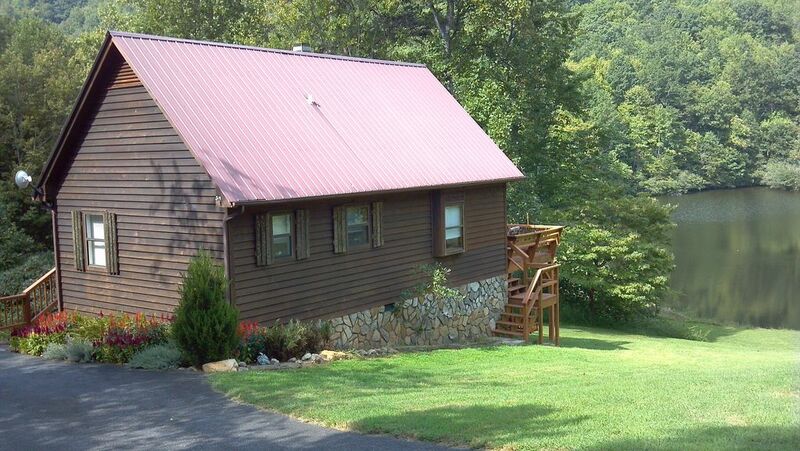 Remotely nestled in the Blue Ridge Mountains of Virginia, you will find this charming lake cottage. Enjoy days and evenings above a picturesque six acre lake with backdrop of a beautiful mountain range. Spend time fishing, paddle boating, blazing a trail into the woods, or relaxing with a good book. Take the time to unwind and get away from it all. Guests are sure to enjoy a memorable vacation in this fully furnished, two bedroom/one and a half bath cottage. The main/master bedroom has a queen sized bed, while the second bedroom upstairs is furnished with 2 twin beds and a private balcony and half bath. The cottage will sleep 5 very comfortably. The large living room is furnished with a large comfortable couch and a gas log fireplace. A table for 4 is off to the side of the living room, but also next to the kitchen which is all open. There is a bar/counter where 2 people can set and eat and also be part of the kitchen area. The living/kitchen area is all one big room with a step down from the kitchen. The cottage is equipped with everything you need to make your get away from it all perfect. Situated on the six acre lake, guests can enjoy the morning just sitting on the deck drinking coffee and listening to the birds sing or watch for a fish to jump up out of the water. Later go for a hike in the woods, or go for a ride in the paddle boat. There is a canoe to enjoy as well. Fishing is permitted as catch and release only. There is a paddle board to enjoy on the lake, and if the day is really hot, you may want to take a swim in the lake. The water is cool, but very refreshing. Spend the day away, enjoying nearby attractions. The cottage is approximately 10 miles for Mt Airy, NC, the hometown of Andy Griffith. Visit the Andy Griffith Museum, which houses the world's largest collection of Andy Griffith memorabilia. The Blue Ridge Parkway is only about 12 miles away. Fancy Gap is just off the parkway, and has several antique stores and gift shops. The Deli Gap Restaurant is highly recommended for a great lunch. The Yadkin Valley Wine Country, which has thirty three wineries, has several wineries just a few miles away. Five of them are located in the Mt Airy area. Ask us for recommendations or visit for listings of all the wineries. Ken Holdaway built this lovely cottage and the 6 acre lake. Ken has lived in Ararat, VA for over 40 years and is a hobby orchardist. His home and orchard is less than 1/4 miles from the cottage. Sharon Poindexter is his significant other and is managing this VRBO site. We love people and know that we will enjoy getting to know the visitors to this beautiful setting in our mountains. Also, since we are so close by, visits to the orchard house is very possible. At the orchard house you will see several kinds of animals (peacocks, chickens, Bengal cats, etc) in addition to all the trees. The orchard has several varieties of fruit trees. There are peach, apple, pear, plum, apricot, fig trees and many different kinds of berries. The most unique thing about the cottage is that it truly is away from it all. There is one neighbor that lives close enough to make you feel safe, for those who might not really want to be that far away from it all. You are still close to everything you need, groceries, gas, etc. This cottage property is very rural. It is located at the base of the Blue Ridge Mountains. When you top the drive into the cottage, the view takes your breath away. Wonderful surprise. We love staying at this sweet cottage. This was the third stay of many more to come. Sharon and Ken are so hospitable and take very good care of their cottage and property. We had to leave early due to bad weather but enjoyed the day we had there. Everything we needed was supplied at the cabin. Nighttime sky was breath taking. We will return. Beautiful location. The mountain veil and lake views were amazing. Very quiet and tranquil. We enjoyed our stay over the Thanksgiving Holiday. Being effected by hurricane Florence, we needed some time away for our construction zone.The quite setting was just what we needed. The cabin was well stocked and we felt at home as soon as we walked in the door. We like to see that other dog owners are taking care of the pet friendly properties offered on VRBO. Our five year old lab (Macy) seemed to enjoy her time looking out of the sliding glass doors and being out on the deck. The gate on the deck was perfect. We spent 3 nights in this lovely cottage in the woods. It is every bit as pretty as the pictures show, and not too far from Mt Airy, where you can find shops and breweries and the nicest people ever. Also nearby, is Buffalo Mountain, Mabry Mill and the town of Meadows of Dan, so quaint and wonderful. Things to note about the cottage - it is what it says it is... a cottage in the woods. And with that comes bugs (we were there during stink bug and hornet season) that like to come into the warm house. There were plenty of towels, linens and everything you need in the kitchen. The TV has 3 local stations, and a dvd player, but with the lovely view, a campfire, and a sky full of stars, you don't miss having cable. Phone coverage was very limited, as well, until you got into town. Sharon and Ken were wonderful to work with, and very accommodating. If you're not looking for luxury, just a wonderful homey place to unwind...this is it! The cottage is beautiful, clean, and well equipment!! Quiet get away. The owners are wonderful and gracious. We are ready to go back with the kiddos in warmer weather to enjoy the pond.